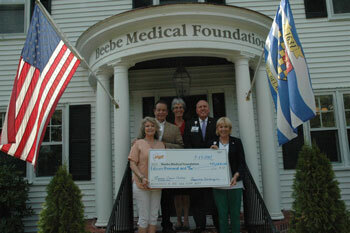 The Beebe Medical Foundation recently received a $15,000 donation from the Delaware Celebration of Jazz, producers of the Rehoboth Beach Jazz Festival. This generous gift was presented to the Foundation on July 13 by Board Members, Dennis Santangini and Kas Naylor. The gift will be used to help serve oncology patients at Beebe Healthcare’s Tunnell Cancer Center. “We are so thankful for this year’s contribution from the Rehoboth Jazz Festival in addition to their past twelve years of generosity,” said Tom Protack, Beebe Medical Foundation’s Vice President of Development. Thirteen years ago, the Delaware Celebration of Jazz selected the Tunnell Cancer Center as its designated recipient for the festival’s proceeds. On a personal note, Delaware Celebration of Jazz Board President Dennis Santangini, shared, “Years ago, when my wife was diagnosed with stage 4 lung cancer, Beebe Healthcare’s Tunnell Cancer Center, and in particular Dr. Peri, provided us with tremendous support and compassion during that difficult time. In an effort to keep this wonderful institution helping people who have been afflicted with the disease, we choose Tunnell Cancer Center as our charitable designation. Board Member Kas Naylor says of Dennis Santangini, “If not for Denny, I’m not sure we’d still have the Jazz Festival. His commitment and hard work has helped this annual festival continue to grow and flourish.” While he has always had a strong passion and appreciation for music as well as bringing that to the larger community, Santangini chuckles as he confides, “I can’t event carry a tune in the shower.” Santangini also feels we are so lucky to have this great event in wonderful Sussex County, Delaware. “We are so honored to receive such generous support from the Jazz Festival. This gift comes a few short weeks after the passing of Leon Galitzin, who was such a strong and loyal advocate for our Beebe Tunnell Cancer Center. We will always remember Leon for his love of life and support of Beebe. A special thanks to Denny and Kas for your wonderful partnership with Beebe and for your on-going support and commitment to the Tunnell Cancer Center,” said Judy Aliquo, CFRE, President & CEO, Beebe Medical Foundation. Save the date for the 28th Annual Jazz Festival produced by the Delaware Celebration of Jazz 501(c)(3) Non-Profit Corporation to be held October 12-15, 2017. For more information, visit www.rehobothjazz.com. Beebe Healthcare is a sponsor of the Rehoboth Jazz Festival for the Opening Night and the Saturday night 7:30 p.m. All-Star show. Photo Caption: Shown in the picture left to right: Kas Naylor, Delaware Celebration of Jazz Board Member; Dennis Santangini, Delaware Celebration of Jazz President, Diane Barlow, Gift Planning Officer, Beebe Medical Foundation; Tom Protack, Vice President of Development, Beebe Medical Foundation; Judy Aliquo, President and CEO, Beebe Medical Foundation. Beebe Healthcare is a non-for-profit community healthcare system with a charitable mission to encourage healthy living, prevent illness, and restore optimal health for the people residing, working, or visiting in the communities we serve. It offers services throughout Southern Delaware for residents and visitors, including a 210-licensed-bed hospital, a cancer treatment center, home care services, and outpatient facilities providing walk-in care, lab, imaging, and physical rehabilitation services. For more information, please visit us online at www.beebehealthcare.org.